Corn snakes make excellent choices as pet snakes. Corn snakes are closely related to rat snakes (rat snakes also belong to the genus Elaphe) and are also sometimes called red rat snakes (especially the amelanistic color variations). They are native to the southeastern United States, are mostly land-dwelling and are active mainly at night or at dusk and dawn. Pet corn snakes are generally docile, relatively easy to care for and do not get very large therefore they make a great choice for beginner snake owners. However, they are also favorites with experienced keepers due to the vast array of beautiful colors and patterns selective breeding has produced. Names: Corn snake, Elaphe guttata, red rat snake. Lifespan: Corn snakes can live to be around 15 to 20 years old and sometimes even longer. 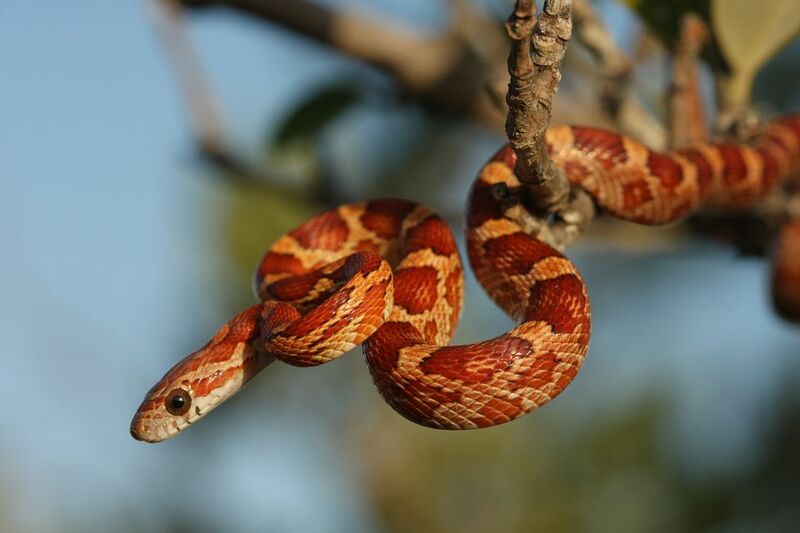 Size: Corn snakes reach a mature size of 3 to 5 feet but may occasionally be up to 6 feet long. These low-key snakes allow people to handle them and are generally docile. They like to burrow and hide, so a decent-sized enclosure and loose substrate (lining) on the bottom is key. Like most snakes, corn snakes are excellent escape artists, so their enclosures should be secure. If a snake gets out of its cage it can get lost or hurt itself (and give a household visitor a good scare). Corn snakes—again, like most snakes—are carnivores. In the wild, they stalk their prey primarily via smell rather than sight. And when they feel threatened, especially in the wild, they may vibrate their tail, similar to rattlesnakes, as a defense mechanism. Picking a solid cage is a necessity for proper corn snake care. A 20-gallon long tank (a longer and shallower version of a 20-gallon tank) makes a good-sized cage for a corn snake. It is important to get a secure-fitting lid that can be clamped down for this tank as well. Corn snakes will push at the lid with their noses looking for weaknesses and tiny openings, so the fit of the lid is very important. Provide hiding spots for your corn snake. A hide box (any closed-in container like a cardboard box will do) should be provided that is just large enough for the snake to curl up in; if it is too large the snake will not feel as secure. Pieces of bark can also provide hiding spots for your snake if it is on a substrate that allows it to burrow under the bark. Ideally, a hiding place should be available in both the cooler and warmer ends of the enclosure. Also, provide a branch for climbing. Maintaining your corn snake's cage at the correct temperature is vital. Keep a temperature gradient of about 70 to 85 F (21 to 29 C) in the cage. Under tank heat pads or heat tape can be used, but they can make it difficult to monitor how hot the enclosure is getting. An overhead incandescent heat light is preferred, but corn snakes are from temperate climates, so they do not need tropical temperatures. Make sure their enclosure does not get too hot. A variety of materials can be used as a substrate for your pet corn snake. Newspaper is the utilitarian choice since it is very easy to clean up, but its appearance in the cage leaves a little to be desired. Indoor/outdoor carpeting ("Astroturf") can be used, and if you cut two pieces, you can rotate them by swapping the clean one out for the dirty one at cleaning time and thoroughly wash and dry the soiled piece. Pine bark chips are another good choice. The chips that are soiled with feces can simply be scooped out and thorough cleaning is done as needed. Aspen shavings can be used in a similar manner, although it is probably a good idea to move the snake to a separate container for feeding so that the shavings are not inadvertently ingested. Sand, soil, corncob, pine shavings, and cedar shavings are not good choices for corn snakes. Corn snakes should be fed pre-killed mice or small rats, although the latter is only suitable for larger corn snakes. Hatchlings are started out on pinkie mice for feedings, and the size of the prey is increased as the snake grows. The prey item can be as wide or a little wider than the snake's head. Young growing snakes should be fed a couple of times a week, while adults need only be fed one appropriately sized prey item every week or 10 days. Your snake's appetite might decline around the time of a shed, so reduce feeding frequency if your snake is about to start shedding. A water dish is also necessary, and the water should be kept meticulously clean. Snakes often defecate in their water, and when this happens, the waste should be cleaned immediately. A heavy dish several inches in diameter makes a good water source. You may find you snake soaking in the dish, particularly before a shed. Mouth rot, or infectious stomatitis, is a bacterial infection of the mouth that often causes saliva bubbles as well as inflammation in and around the mouth. If left untreated, this ailment can cause infection in the bone and the snake's teeth may fall out. As with most snake breeds, corn snakes are susceptible to fungal and respiratory infections. The former is marked by discoloration of the skin. A sign of respiratory infection is open-mouth breathing or wheezing. All of these health issues require treatment by a reptile veterinarian. When choosing a snake, a captive-bred specimen is the best choice and shouldn't be too difficult to find, since corn snakes breed fairly readily in captivity. Look for a snake that doesn't have any retained skin from a shed. Your snake should also have clear eyes, no cuts or scrapes, no signs of mites or ticks, and a clean vent, and is alert and flicking its tongue. Due to its brownish-orange coloring, the corn snake is often mistaken for the venomous copperhead snake (Agkistrodon contortrix), but the two breeds share few attributes. You can read our profiles of other snake breeds here.